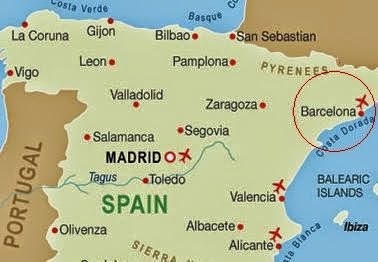 Home / Barcelona / Barcelona City / General Information / Geographical Location / Location / Map / Where is Barcelona / Where is Barcelona? Barcelona is a city in Spain. It is nearby the Mediterranean sea. A European city Barcelona is one of the best cities of Spain. I hear you ask Where is Barcelona and I should tell you that it has the best location when compared to other cities of Spain. It is located in the North Eastern Mediterranean coast of mainland in Spain. You can reach Barcelona driving approximately two hours South from Frenh Pyrenees. Barcelona is the largest metropolis locating in Mediterranean. Barcelona is a capital city of Catalunya which has also scenery of the sea. So people in Barcelona are very lucky when compared to Madrid. It has got long and beautiful sandy beaches about 4.2 km longs. Barcelona has the biggest and fascinating sea view with its waves due to Mediterranean Sea. If we talk about the geographical location; Barcelona is in 41:18:07N 2:05:31E and you can find the map about the coordinates below. How to go to Barcelona? There are many ways to go to Barcelona while you plan your travel. Barcelona cityhas many travel advantages. It has many ways such as by plane, cruise, private car or train options you can use. First of all you should decide what kind of travel options you would like to choose. Let me give you some information about the transportation ways in other article called Transportation in Barcelona.